TORONTO, ON–(Marketwired – February 20, 2014) – Today, President Obama, Mexican President Peña Nieto, and Canada’s Prime Minister Harper committed their nations to taking steps to protect the monarch butterfly migration‎ across Canada, the United States, and Mexico. Recent scientific evidence by World Wildlife Fund and Mexico’s National Commission on Natural Protected Areas document a steady decline of monarch butterflies in the hibernating sanctuaries in Mexico. 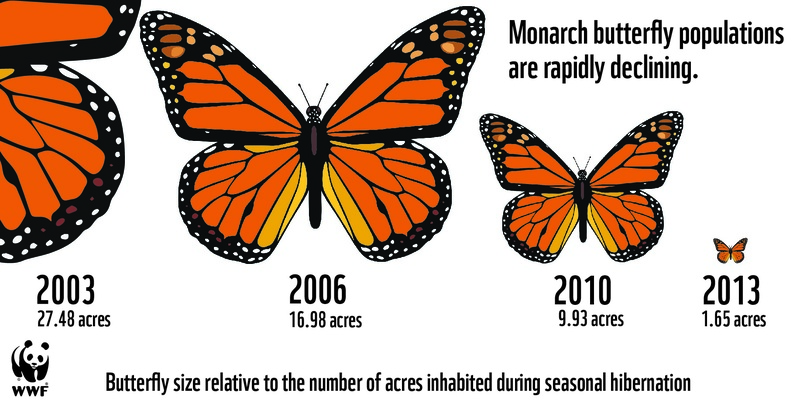 In December 2013, scientists recorded the lowest levels on record, with monarchs covering a mere 0.67 hectares (1.65 acres) of forest cover — a 44% decrease from the previous year. “This butterfly migration reflects an ancient bond between three nations that pre-date the countries themselves. Business as usual may permanently sever this bond, but today’s pledge gives us renewed hope that we can save the monarch migration for centuries to come,” said Carter Roberts, president and CEO of World Wildlife Fund. Protecting the monarch migration requires measures to ensure each phase of their annual cycle of breeding, migrating, and hibernating continues. To meet this challenge, cooperative conservation efforts must be undertaken in all three countries to ensure that sufficient habitat is available on the monarchs’ hibernating grounds and sufficient breeding and migration habitat is available to maintain, and enhance North American monarch populations. Mexican President Enrique Peña Nieto announced that, as a part of the sustainable development talks, all three leaders agreed to create a tri-national working group for the conservation of the monarch butterfly. “We have agreed to conserve the monarch butterfly as an emblematic species of North America which unites our three countries”, he said. “Today’s declaration is a smart first step to save the monarch migration, but we can’t stop there. We must restore and protect habitat in all three countries, limit the use of herbicides in the U.S. and Canada, and halt habitat loss from both, grassland conversion in the U.S. and deforestation in Mexico,” said, Omar Vidal, Director General, WWF in Mexico. Providing tools and guidelines to inform monarch conservation efforts, such as (i) promoting mowing, burning, thinning, and harvesting regimes designed to restore ecosystem structure and species composition; (ii) milkweed propagation for increasing seed stock availability; (iii) inclusion of milkweed in habitat restoration plantings; and (iv) seeding utility right-of-ways with native plants, including milkweed. Supporting state and federal agricultural conservation programs that protect and restore habitat for monarch butterfly foraging, breeding, and migration such as planting seed mixes that include milkweed and nectar plants and set aside programs such as the Conservation Reserve Program. Decreasing harmful effects of insecticides by improving implementation of Integrated Pest Management practices, limiting the use of neonictinoids, a specific class of insecticides widely used in agricultural production, and by reducing off-target exposure. Protecting the monarch reserve’s buffer zones from unsustainable forest exploitation, fires, grazing, and agricultural expansion. Ensuring year-round and effective on-the-ground surveillance and law enforcement strategy to avoid large-scale and small-scale logging in the core zone of the monarch reserve. Increasing focused and coordinated actions with regards to the payments for environmental services to local communities by the federal and state authorities as part of a long-term investment in sustainable economic alternatives. Implementing a comprehensive regional plan to create (and maintain) job opportunities, improve and expand education, improve basic services such as sanitation, electricity and water.